To get reasonable prices you should book your flight ticket with large advance. If you can choose, consider that the cheapest period to fly (at least for the routes Europe - USA) is from October to November and in spring. The worse period is from July to August and December. For all the airlines listed in this page you can buy your ticket online, receiving a code instead of a real ticket. Buying the same ticket in a travel agency is not much more expensive, usually the difference is less than 50 USD. The fact is that sometimes the cheapest tickets are web-fares, not available for travel agencies, and in this case the price difference can be higher. Remember that you will probably have to move your return ticket, first because it's difficult to guess the exact day you'll be coming back, second because you usually cannot book tickets more than a year in advance. You should then ask about changing policy and fees: sometimes one change is included, sometimes you have to pay a fee that can be 50, 100 USD or more. All these airlines offer online check-in. This means that 24 or 48 hours before your flight you can go to their website and access your booking. You will be required to enter your personal data, choose your seat in the airplane (very useful) and give some contact information. When you are done, you receive a boarding pass to print, so that once you are at the airport you just have to go to the Fast Bag Drop desk instead of doing the line at the check in and simply give them your luggages. You're definitely advised to do that. Actually you can access your booking even weeks before your flight, so you can enter all your data and just go back the day before to confirm. If you want a good seat in the airplane, check in online as soon as it's possible. Here are some of the major airlines connecting California with the rest of the world. Previous EAP students that already tried Air France, please add you experience. 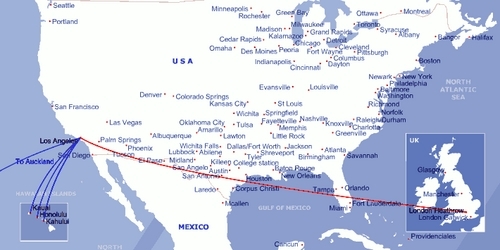 San Diego airport is connected by British Airways only with two national destination, Chicago and Dallas. 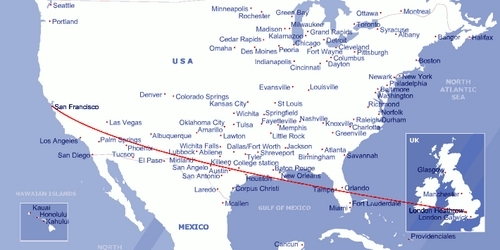 Unless you want to change twice, this means that going to San Diego with British Airways has to be considered only if your home city is directly connected with one of these two airports. Moreover, entering in the US at an airport different from your final destination is not a good idea, because security and immigration procedures in the US require you to have your luggage and documents checked as soon as you enter the country. The risk is that this checking procedure delays your transfer and make you miss your next flight. Even if you have a large waiting time before your next flight, having to take your luggage and check in it again can be not the easiest thing to do. Unless you're going exactly to San Diego, you should then opt for Los Angeles airport (LAX), which is generally cheaper to reach than San Diego airport (SAN). LAX is connected to London Heathrow (11 hour flight), which is connected with almost any other airport in Europe and outside Europe. Remember, if you're changing in London, to check that you're arriving and leaving at the same airport, because there are more than one in London and they all serve international destinations. In these last years passing from London Heathrow may be not your first option because of the strict rules they are enforcing for security reasons: mainly, the fact that checking procedures are longer and stricter (and can cause delays), the fact that you are allowed to take with you in the cabin a laptop bag only instead of a laptop bag / purse + hand luggage. San Francisco (SFO) too is connected to London Heathrow, and the same kind of consideration are valid for this route. Changing your return ticket costs about 130 USD and you have to pay it at the airport. Unless you are studying in the same city, this means that you have to go there during your stay only to change the ticket, instead of doing that on the phone. It's an extra price you should consider. You can actually pay online, but you need an American credit card with your name or two American credit cards if they belong to another person. Swiss Airlines connect both San Diego Airport and San Francisco Airport with Chicago. The same consideration we made about this route for British Airways are valid here (see above). Los Angeles Airport is instead connected with the European airports of Frankfurt and Zurich. Remember that Zurich Airport suffers sometimes (rarely actually) of delays caused by snow. This should worry you only if you are traveling in the coldest days of the year. http://www.airlineconsolidator.com/ Finds international flights from a variety of airlines. http://www.cheaptickets.com Great deals for flights within the U.S.
http://www.southwest.com Specializes in flights throughout the Southwest region of the U.S.